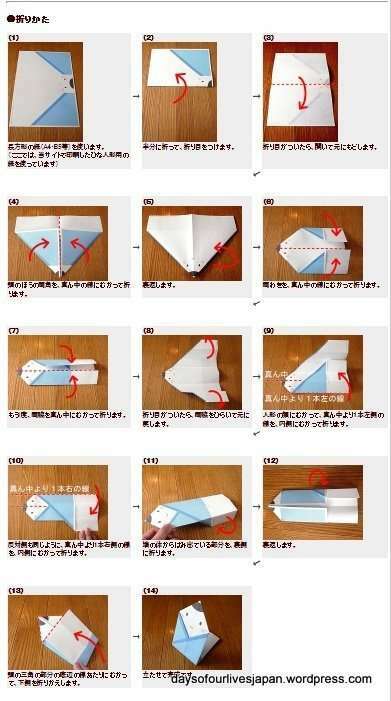 This is a really easy origami craft that preschoolers and origami beginners can enjoy. All you need is the free A4 printables available on HappyLilac.net. You don’t need to be able to read Japanese. The blue Dairi-sama printable can be found here. The pink Hina-sama printable can be found here. My 4 year old was able to complete his origami dolls without assistance, using the easy to follow visual guide here on HappyLilac.net . Again Japanese reading ability not required as the method is shown step-by-step in photos, as pictured below. Three old was also able to do most of the folding herself, she just need a little help for the last fold. They really enjoyed this easy craft and were very proud of their origami dolls! More easy Hina Matsuri crafts to follow during the week! You’re full of the craft and printables this week! Very handy.